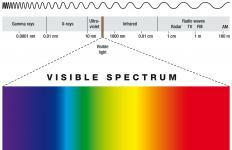 The visible spectrum is a type of continuous spectrum. A continuous spectrum includes energy at all wavelengths. This differs from a discrete spectrum, where radiation does not exist at every wavelength, but only certain ones. Spectra are a topic of interest for astronomers, chemists, and other people who collect information about the composition of objects and materials by studying their spectral profiles. One example of a continuous spectrum familiar to many laypeople is the visible spectrum, the array of wavelengths of light visible to the human eye. When a measurement of emissions from a continuous spectrum is viewed, a researcher can see emissions and their concentrations at different points. In the case of visible light, this can be represented with an array of colors. Other types of radiation have to be represented with plots and colorized charts because the radiation is not visible. It is possible to gather information about an object by looking at the kind of energy found in its spectrum and plotting it along a curve. In some cases, a readout has bright or dark lines, indicating the presence or lack thereof of radiation emitted by the source. These show that the spectrum is discrete, and energy of some wavelengths is not coming through. This can occur for reasons like obstructions between the source and the detector. When scientists were expecting a continuous spectrum, the appearance of lines can indicate that an interesting phenomenon is occurring. A classic example can happen when researchers look at the spectrum of a star's radiation after it passes through a cloud of gas. The gas absorbs energy at some wavelengths, creating an absorption or dark line spectrum. Researchers can also look at the spectrum of the gas itself and should see a emission or bright line spectrum, where the energy trapped is released. When the spectra of the star and the gas are held up to each other, the bright lines from the cloud of gas should match the dark lines seen in the readout of the star’s spectrum. It’s also possible for stars themselves to generate emission or absorption spectra because they are surrounded in clouds of gases that can interfere with the emission of radiation. Incandescent lightbulbs are an example of a continuous spectrum. When they are turned on, they emit energy of all wavelengths within a specific range. Neon signs, on the other hand, produce discrete spectra with concentrations of red, blue, or other colors of light, which creates a very distinctive visual appearance. The same property can be seen when researchers heat samples of unknown gases and minerals, which may flare when heated, creating spectral emissions that betray their contents. What Are the Different Types of Digital Percussion? What is a Line Spectrum? What is a Swarovski Crystal?